My inspiration for this flower pin came from Blair. Here is the tutorial she has on her blog - scroll half way down the page. I also used a little bit of fabric stiffener to form the petals. A good way to use up fabric scraps. I love this bright, cheery, paisley design and also the vintage button. This is going to be in my etsy shop, along with more like it on the way. There are many ways you can use this - pin on your fav fabric purse, blouse, jacket, pillows, etc. - to brighten up your day a bit. 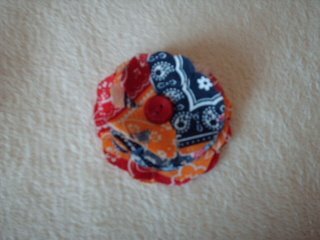 Super cute, love the fabric selection and the button in the center! Thanks Gina! I'm drawn to paisley designs and bright fabric. I have a lot of this fabric left I bought from a thrift store. Might try my hand in making a pouch, too.